Last week at Newholme, Walton and Cavendish hospitals, we belatedly discussed Valentine’s Day. But it’s never too late to talk about love. Love can be a tricky subject for older patients, who may have suffered bereavement. But for some people, it’s a chance to revive cherished memories of a life-long partner. Some patients have partners who lovingly visit them, and sending and receiving Valentine’s cards is really important in keeping the love alive, despite difficult times. These poems represent romantic stories and recollections of younger days. I hope you enjoy them. The beauty of loving someone for life. He was in the army. He had curly hair. There would be piles of letters from far away. A few weeks later, I came home, and there he was. And he’d already asked my dad for my hand. Dad told him to look after me. Running towards him in high heels. When you’d do anything for someone. Love and kindness lead the way. Families are loving and giving. Even though they’re far away. A phone call – coming to see me. It’s the same as it always is, being at home. Still giving each other cards. I love you and I see you. And romance lingers in the air. It was donkey’s years ago. Was it true love at first sight or on the rebound? We were too close to send love letters. Working together at Masson Mill. You got used to the noise. And I got married in my winklepickers. I went to dances in Edale. Military two-step and barn dances. This week, we’ve been looking at weddings, and we’ve come up with some great poems and little snippets. 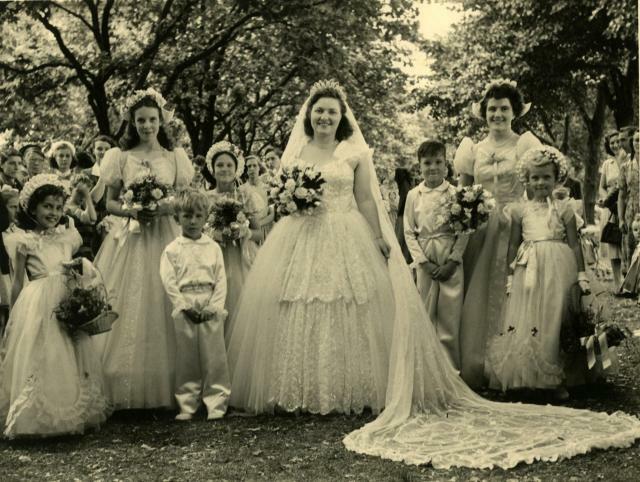 We enjoyed talking about wedding photos through the decades, from 1940s wedding dresses made from parachute silk, to crocheted fashion disasters in the 70s and white meringues in the 80s. We talked about old traditions, such as inviting a chimney sweep to the wedding for good luck, and the bride wearing a silver sixpence in her shoe. The aisles are filled with flowers. Hidden under the sole of her left foot. With his mates, as a single man. That the Best Man remembers the rings. The groom at the altar, hoping she’ll arrive. She comes down the aisle with her father at her side. Relief as they both say “I do”! And an absolutely gorgeous husband! She was one hell of a girl! But my wedding didn’t last long. I was always in the pub!